Shock absorption from heel to toe designed for people on their feet all day. The unique rib configuration of Energy Tracks actually absorbs, stores and releases impact energy, helping to reduce fatigue and improve performance. A thicker heel pad provides additional heel strike protection and heightened medial and lateral edges deliver increased stability. Energy Tracks can be trimmed to fit and are perfect for those who stand or walk for long periods of time. Lifetime Warranty. 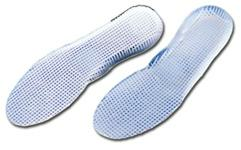 Provides relief for tired, achey or swollen feet.